It's official: Pluto's "heart" now bears the name of pioneering American astronomer Clyde Tombaugh, who discovered Pluto in 1930. And a crater on Pluto is now officially named after Venetia Burney, the British schoolgirl who in 1930 suggested the name "Pluto," Roman god of the underworld, for Tombaugh's newly-discovered planet. These and other names were proposed by NASA's New Horizons team following the first reconnaissance of Pluto and its moons by the New Horizons spacecraft in 2015. The New Horizons science team had been using these and other place names informally to describe the many regions, mountain ranges, plains, valleys and craters discovered during the first close-up look at the surfaces of Pluto and its largest moon, Charon. A total of 14 Pluto place names have now been made official by the IAU; many more will soon be proposed to the IAU, both on Pluto and on its moons. "The approved designations honor many people and space missions who paved the way for the historic exploration of Pluto and the Kuiper Belt, the farthest worlds ever explored," said Alan Stern, New Horizons principal investigator from Southwest Research Institute, Boulder, Colorado. "We're very excited to approve names recognizing people of significance to Pluto and the pursuit of exploration as well as the mythology of the underworld. These names highlight the importance of pushing to the frontiers of discovery," said Rita Schulz, chair of the IAU Working Group for Planetary System Nomenclature. "We appreciate the contribution of the general public in the form of their naming suggestions and the New Horizons team for proposing these names to us." Stern applauded the work of the New Horizons Nomenclature Working Group, which along with Stern included science team members Mark Showalter -- the group's chairman and liaison to the IAU -- Ross Beyer, Will Grundy, William McKinnon, Jeff Moore, Cathy Olkin, Paul Schenk and Amanda Zangari. The team gathered many ideas during the "Our Pluto" online naming campaign in 2015. 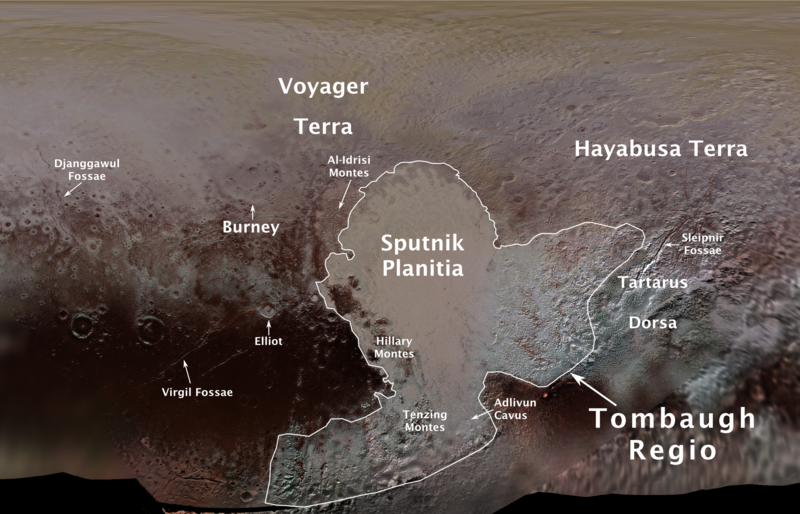 Following on Venetia Burney's original suggestion, several place names on Pluto come from underworld mythology. "I'm delighted that most of the approved names were originally recommended by members of the public," said Showalter, of the SETI Institute, Mountain View, California. Al-Idrisi Montes honors Ash-Sharif al-Idrisi (1100–1165/66), a noted Arab mapmaker and geographer whose landmark work of medieval geography is sometimes translated as "The Pleasure of Him Who Longs to Cross the Horizons." The New Horizons spacecraft – built and operated at the Johns Hopkins Applied Physics Laboratory in Laurel, Maryland, with a payload and science investigation led by SwRI -- is speeding toward its next flyby, this one with the ancient Kuiper Belt object 2014 MU69, a billion miles beyond Pluto, on Jan. 1, 2019.